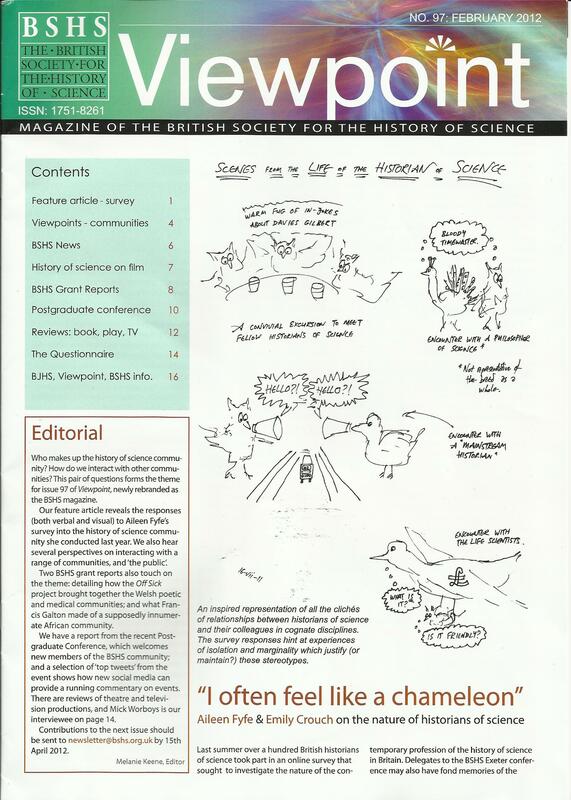 However, it is the cover story that I want to feature today, relating to some research that Aileen Fyfe has undertaken within the British history of science community, and the membership of the BSHS itself, regarding their background, careers and sense of identity. As well as an online questionnaire, Aileen asked (pressed/pushed/forced?) attendees of last summer’s Exeter conference to illustrate their perception of the discipline in relation to the rest of academia and other relevant fields. I remember producing some rather lame spider chart, but the article reproduces some other efforts, including a Venn diagram that places HSTM (history of science, technology and medicine) at the centre of science, humanities and social sciences. There is also a mind-map style view of one stick man’s sense of their ‘academic landscape’, which has HSTM interacting with philosophy of science, philosophy, anthropology, sociology, literature, science and literature, history, geography, historical geography, history of art, architecture, museums, science and science communication. Any more to add? Plenty, I’ll bet. This particularly tickled me exactly for the close-shop reasons that the first image depicts as the convivial atmosphere among fellow historians of science – the reference to a “warm fug of in-jokes about Davies Gilbert” is lovely (and also suggests to me the author of this anonymous cartoon, as I had just such a conversation in Exeter….). Meanwhile the historians and philosophers consider each other timewasters, the conversation with a ‘proper’ historian takes place over a vast gulf and the “encounter with a life scientist” suggests an inferiority complex among the historians and bafflement from the scientist. Does this image work for everyone? As a joke, at least, it probably does, although it will vary depending on the background and current circumstances of the individual historian of science. As someone who started my university career in history rather than science, I am in the minority, and I think my sense of conversations with historians or scientists might be slightly different. Aileen’s survey does more to probe some of these differences, as demonstrated in this article and as will be explored in more depth in her planned article for a higher education research journal. For me, the wide range of disciplinary identities and loyalties within history of science is one of its strengths, although it certainly causes problems in terms of making ourselves heard, within institutions as well as in the wider public sphere. * If any BSHS members are interested in reviewing TV programmes, films, plays, popular or fictional works relating to the history of science, please contact the editor at viewpoint [a] bshs [dot] org [dot] uk. ** I hope I’ll be forgiven for a little motherly pride whenever I see Viewpoint, which I developed back in 2005/6 and edited until the end of 2008. It has largely continued with the same design, features and broad focus, although subsequent editors Rosie Wall and Melanie have continued it brilliantly. It was rewarding, but a great deal of work, even for a thrice annual publication, involving soliciting, editing and designing all the content – all, of course, undertaken without payment. Melanie has recently agreed to continue as editor, which is fantastic, and I hope we find someone else with the right levels of energy and flair to continue after her term ends in 2014.